In addition to direct trigonometric functions sine and cosine, there are and return them to the arc sine and arccosine. They can be used to calculate the angles using the known values of the direct functions. There are several variants of practical implementation of such calculations. Use the inverse cosine (arccosine) to find the angle at the known value of the cosine. The desired value of the arc tangent, and the angle can be found for example in "tables Bradis". Paper copies of this Handbook are available in libraries and bookstores, and e-can be found on the Internet. Find online online calculator to calculate inverse trigonometric functions and determine with their help the desired value. To use such services much easier than to look up values in tables. 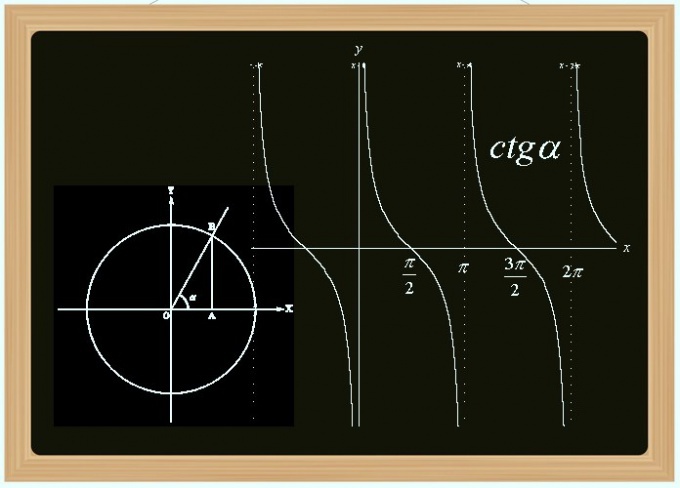 In addition, they can simplify the calculations since many of these calculators allow you to compute not only single values but also to the results based on the formulas composed of several operations with the trigonometric functions. Use the standard calculator Windows, if you want to do without access to the Internet. Start command of the calculator placed in the main menu on the "start" button. Opening it, navigate to "All programs", then to "Standard" and click "Calculator". By default, it starts with the simple interface, not having tools for trigonometric calculations. Open it in menu "View" and select the item labeled "Engineering". Enter a value for the cosineand from the keyboard, or clicking corresponding buttons of the calculator interface. Can be used to input a copy operation (CTRL + C) and paste (CTRL + V). Then select the units which should be represented the result (degrees, radians, or grads) - the corresponding selector is a line below the input field number. After this it is necessary to mark invert functions in the Inv checkbox. That's all cooking is over, click the cos and the calculator will calculate the value of the inverse cosinefunction (arccosine) of the given value and present the result in the selected units. The sine and cosine is the direct trigonometric functions, for which there are several definitions through a circle in a Cartesian coordinate system, using the solution of a differential equation, using acute angles in a right triangle. Each of these definitions allows us to derive a relationship between these two functions. The following is probably the most simple way to Express the cosine in terms of sine, through their definitions for acute angles of a right triangle. Express the sine of an acute angle of a right triangle using the lengths of the sides of this figure. According to the definition, the sine of the angle (α) should be equal to the ratio of the length of the sides (a), lying in front of him - the side to side length (c) opposite the right angle is the hypotenuse: sin(α) = a/c. Find a similar formula for the cosine ofa same angle. By definition, this value should be expressed by the ratio of the length of the sides (b) adjacent to this corner (second side) to the length of the side (c), which lies opposite the right angle: cos(a) = a/c. Rewrite the equation resulting from the Pythagorean theorem, so that it was involved in the relationship between the legs and the hypotenuse, derived from the previous two steps. To do this, first divide both sides of the original equation of this theorem (a2 + b2 = c2) on the square of the hypotenuse (a2/c2 + b2/c2 = 1), and then the obtained equality rewrite in this form: (a/c)2 + (b/c)2 = 1. Replace in the resulting expression of the ratio of the lengths of the legs and hypotenuse trigonometric functions based on the formulas of the first and second step: sin2(a) + cos2(a) = 1. Express the cosine of the obtained equality: cos(a) = √(1 - sin2(a)). This problem can be considered solved in General. If in addition to the common solutions you need to obtain a numerical result, use, for example, a calculator built into the Windows operating system. The link to his startup, locate the subsection "Standard" under "All programs" on the main menu OS. This link is articulated succinctly - "Calculator". To be able to calculate using this program trigonometric functions turn it on "engineering" the interface is press Alt + 2. Enter this in terms of the value of the sine of the angle and click interface designation x2 - so you put up the original value in the square. 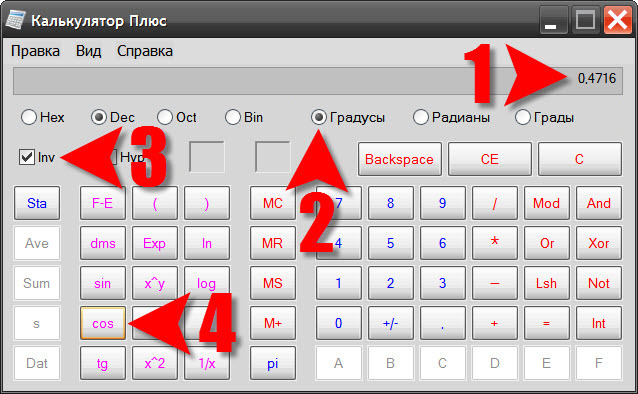 Then enter on the keypad *-1, hit enter, then type +1 and hit Enter again - this way you subtract one square of sine. Click the button with the icon of the radical, to extract the square root and get the final result. The cotangent is one of the trigonometric functions derivative of sine and cosine. It is an odd periodic (period equal to PI) and not continuous (breaks at points that are multiples of the number PI) function. To calculate its value can be the largest angle, according to the known lengths of the sides of the triangle, the values of sine and cosine and in other ways. If you are aware of the value of the angle, calculate the value totangent , for example, using a standard calculator Windows. To run it open the main menu, type keyboard "ka" and press Enter. Then set the calculator in engineering mode - select the item with the same name under "View" menu or use the shortcut Alt + 2. Enter value of angle in degrees. Separate buttons for the function cotangent is not provided, so first find the tangent (click tan), and then divide the resulting value unit (click the button 1/x). If the value of the tangent of the desired angle is given in terms of the problem to compute the cotangent to know the magnitude of this angle is not necessary - simply divide the unit number representing the tangent: ctg(α) = 1/tg(α). But you can certainly first determine the degree measure of the angle using the inverse tangent function the inverse tangent, and then to compute the well-known cotangent of the angle. In General this solution can be written as: ctg(α) = arctg(tg(α)). 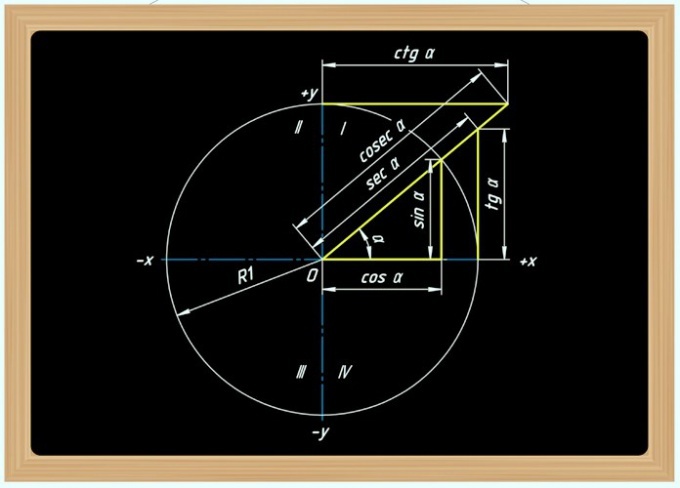 Under certain conditions the values of the sine and cosine of the desired angle is also no need to determine its value. To find the cotangent divide the second number by the first: ctg(α) = cos(α)/sin(α). If the conditions of the problem to find the cotangent given only one value (sine or cosine), convert the formula in the previous step, on the basis of linking their ratio sin2(α) + cos2(α) = 1. It is possible to Express one function through another: sin(α) = √(1-cos2(α)) and cos(α) = √(1-sin2(α)). Substitute the appropriate equality into the formula: ctg(α) = cos(α)/√(1-cos2(α)) or ctg(α) = √(1-sin2(α))/sin(α). Without information on the size of the angle or the corresponding values of trigonometric functions also allows you to calculate the cotangent in the presence of some additional data. For example, it can be done if the angle the cotangent of which you want to calculate, lies in one of the vertices of a right triangle with known lengths of the legs. In this case, calculate the fraction, the numerator of which put the length to that of the other two sides adjacent to the appropriate corner, and the length of the second place in the denominator.